Johannesburg (AP) – The only clue to a literary treasure trove tucked away in downtown Johannesburg is a fading sign, but behind this door is a fantastic maze containing an estimated 2 million books and prints. 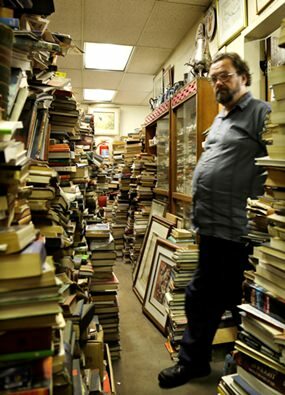 The Collectors Treasury, a three-story bookshop owned by brothers Jonathan and Geoff Klass, is dedicated to preserving history and contains everything from VHS tapes of classic TV to porcelain trinkets, but above all books are prized. “It is the symbol of the history of the human race,” says Geoff Klass. It’s also getting more traffic as downtown Johannesburg is rejuvenated. The bookstore is now on the hipster trail of the trendy Maboneng district with its art galleries and rooftop markets. Visitors thread single file between overflowing shelves and stacks of books. Biographies of Leon Trotsky and Humphrey Bogart sit alongside the story of Wham, the 80s British pop group that launched George Michael’s career. Another room holds fraying antique books, some dating from the 16th century. There are heaps of non-fiction books, ranging from angling journals to contemporary Russian art. “It’s a landscape of books rather than shelves of books,” said Los Angeles set designer David Chow, who learned about the shop online and set aside a whole day of his trip to explore it. The Klass brothers have embraced the Internet as a portal to new customers, but remain devotees of the printed page. Their collection also features a copy of the manuscript of George Orwell’s “1984,” scribbled, corrected and typed over as the author crafted the classic. “What would have happened if he had been writing it on a word processor?” asks Geoff Klass.